With the NCAA Tournament in full swing, there is no shortage of movie, TV and music tournaments being played out bracket-style. I thought why not start a debate of my own and find the biggest Philly sports icon. A few disclaimers here, the first and most importantly the criteria of an icon. I looked up the definition of icon and it was essentially no help at all, so let’s keep it simple and say I’m combining how immortalized the player is today and the quality of the player. Second, the issue of the bracket’s construction. 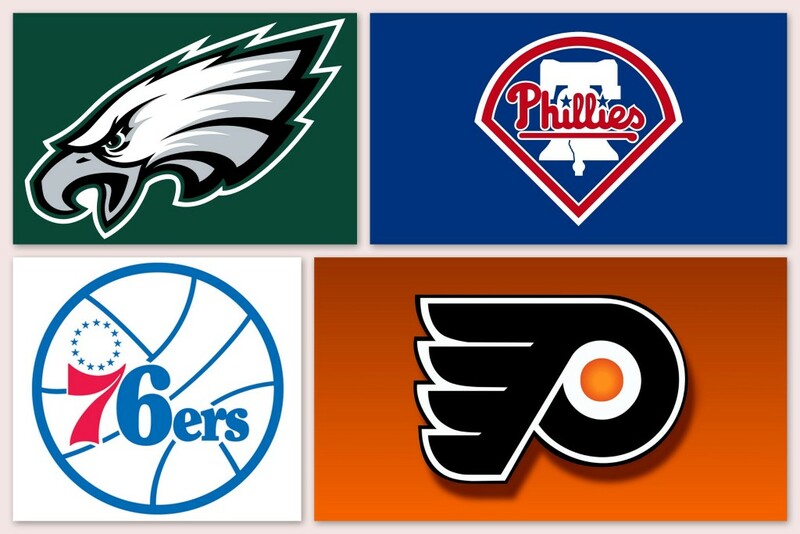 I made an executive decision and had four players represent each of the four major teams, essentially creating a Philly sports icon Sweet 16. I understand there are way more than four deserving athletes per team. And I understand there are athletes that could be represented outside the four major sports, particularly with the boxing history in this town. Adding any more people or regions would have made this thing unruly, and if you think someone deserving didn’t make the cut that’s what the comments are for. Unless you think one of the deserving boxers is Rocky. Then don’t comment. For the love of God don’t comment. Then there’s the seeding of our icons. I started selecting and seeding athletes, and then I realized if I’m seeding and choosing winners it’s obvious who I would have winning each region because I seeded them #1. Who am I to be judge and jury here? Unfortunately I couldn’t get a response to seed the Flyers region. So you actually can berate me if you don’t like those seeds. You can check out the bracket below. Let’s get started. Philadelphia is a football town first and foremost, so that makes Bednarik the overall 1-seed in this bracket. Not quite as strong as Kentucky for me, but when you have a single photo that immortalizes you that’s pretty iconic. Concrete Charlie was the last full two-way player in the NFL and was one of the best at both. He won two championships with the Eagles, was named an All-Pro ten times and was selected to the NFL’s 50th and 75th Anniversary teams. He’s obviously in the Hall of Fame, making it in his first year of eligibility. His recent death is unfortunate, but all the stories that came out about him after are certainly a positive. On the McNabb side of things, well, I never said you had to be an icon in a positive way. The immortalization score for McNabb is about -104. No one received more (unfair) criticism than Five, and that becomes more and more clear as time goes on. McNabb made the Pro Bowl six times, and also has his number retired by the Birds. Why is the criticism unfair? He’s the Eagles all-time leader in career wins, pass attempts, pass completions, passing yards and passing touchdowns. He also holds the NFL record for most completions in a row with 24 and he was the first QB in NFL history to throw for more than 30 TDs and less than 10 INTs. Simply, he’s the best quarterback in franchise history, but couldn’t be run out of town fast enough because he threw up in a Super Bowl. Unfortunately he’s iconic for the negatives, not the positives. The fact Bednarik played 25 years before I was born and I still know who he is says a lot about how iconic he is. Plus it seems like McNabb’s legacy will be remembered for the wrong things. Bednarik moves on. Reggie White kicks off our second legend vs new-era Eagles matchup. White is a 10-time All-Pro to go along with 2 Defensive Player of the Year awards and a championship, though his was with the Green Bay Packers. White’s legacy to me is how people describe him – ferocious on the field and the nicest guy off it. You get a great sense of that while watching his “A Football Life” episode. Plus the Minister of Defense is another nickname for the ages. He goes up against Brian Dawkins, who’s immortalization score is somewhere around a 53 on a scale of 1-10. In all seriousness Dawkins was a great player, making nine Pro Bowls and being named an All-Pro six times. His number is retired by the Eagles. What immortalized him, like White, is the type of person he was in addition to his on-the-field play. Dawkins seems to be as big of an Eagles fan as I am in his retired years, and while he was playing he won the NFL Man of the Year award in 2008. I’m also realizing cool nicknames could be a theme as I’m writing this – Weapon X is a winner. We have our first upset of the tournament! Clearly White was a great player and a great person, but the years he spent in Green Bay (Through no fault of his own obviously) hurt his status as a Philly icon to me. Plus when you listen to sports talk radio today people still call in wishing the Eagles had Brian Dawkins in the secondary for some reason. Point is he’s an icon, and he advances. So I got three whole matchups into this tournament and thought about quitting. This is next to impossible – I grew up watching Dawkins as the face of a team who went to 5 NFC Championship games and a Super Bowl. But as I wrote about Bednarik I saw why he is the 1-seed. He’s an icon not just in Philadelphia but in the NFL. Concrete Charlie moves on to the Final Four. The Flyers region starts with an old-school vs. new-school battle. I wasn’t around for them, but the Flyers’ glory years were certainly the 70s and Clarke was the captain during that time. He also made the all-star team eight times, recorded three 100-point seasons and earned three MVP trophies. The most important stat? His squad won two Stanley Cups, in 1974 and 1975. As far as icons go, this hall of famer was the toothless face of the Broad Street Bullies, and era that is cemented in NHL history. From one captain to another, Claude Giroux represents the Flyer region as the 4-seed. G is obviously right in the middle of his career, but his accomplishments so far are pretty impressive. Giroux is a three-time All-Star and always in the running for the points race. As far as his legacy is concerned, that’s tough to judge, but he was named the cover athlete of NHL ’13 and is still known as a budding star in the league. This is more of what a 1-4 matchup should look like. Giroux is a great player, but Bobby Clarke is a legend. He advances easily. Another iconic era in Flyers history is the “Legion of Doom” from the 90s, and Lindros was the leader of that. The accolades tell you Lindros scored 40 goals 4 times, was an all-star 7 times and won an MVP trophy. Many hockey players can be measured off the ice however, and Lindros is definitely one of those guys. He was a dominating presence on the ice who could also score goals. He also came with a lot of controversy in the media and fans, especially with injuries later in his Flyer career. Eric Lindros is such a big icon that Scott Stevens became a Philadelphia icon for ending his Flyer career. There’s a comparison to a Chris Rock joke to be made here, but I don’t want to expose the kids so you’ll have to ask me if you want to hear it. Admittedly I don’t know much about Bernie Parent, but the fact I know his name and he played from 1965-1979 makes him an icon for me. Widely considered the best goalie in Flyers history, Parent led the NHL in wins and shutouts twice. I would think it’s not a coincidence those two years were 1974 and 1975, when the Flyers won the Stanley Cup. His 47 wins in ’74 were also an NHL record until 2007. He appeared in five All-Star games and took home a pair of Conn Smythe and Vezina trophies. Plus he won the Class Guy Award in 1979. Considering I seeded this region, I bet you didn’t think you’d see an upset did you!? Neither did I, but as I wrote about Parent’s career it’s clear he’s more iconic. It’s only right two players from the 70s face off in the final. This is a tough one. Partly because I never saw either of these guys play and partly because it’s odd comparing a forward and a goalie. But Bobby Clarke is who I think of when I think Flyers icon, and I don’t think I’m alone. He moves to the Final Four. Now we’re cookin’. As a 26-year-old who loves basketball, Allen Iverson is about as big of a Philly sports icon as I can think of. First the numbers: 11-time all-star, 4-time scoring champion, 3-time steals champion, 3-time All-NBA First Team, 3-time All-NBA Second Team, Rookie of the Year, and an NBA MVP award in 2001. 24,368 career points (23rd all-time). He also won an Eastern Conference championship with a motley crew of players and won a game against one of the most dominant teams of all-time in the Finals. But his play on the court isn’t even half of what makes Iverson iconic. I don’t have any proof of this, but I’m pretty sure he invented cornrows. He has a famous press conference that still gets quoted over 10 years later. He created a rap song that never got released. On the sadder side of things he has countless legal and financial struggles. Iverson is one of the most polarizing (iconic) athletes to ever come through Philadelphia. And the man with the unfortunate task of facing The Answer (another sweet nickname) is Hal Greer. Greer deserves credit here; he wouldn’t even be in the tournament if he didn’t. The former National and Sixer made 10 All-Star teams, was named to the NBA’s 50th Anniversary team and retired as the Sixers all-time leading scorer. He also did something Iverson never could – win a championship. Off the court he has a street named after him in his hometown, which is always cool. Sorry, Hal. You ain’t taking down Allen Iverson. He moves to the regional final. I’d like to thank Jake here for creating the most ridiculous first-round matchup possible. I have no idea how to distinguish these two, but I’ll try. To make it simple, Wilt Chamberlain is one of the greatest, most dominant basketball players ever. Thirteen-time all-star, seven-time All-NBA First Team, four-time MVP, two-time NBA champion, the NBA’s all-time leading rebounder to name a few accomplishments. Oh yeah, he scored 100 points in a game. The man averaged 30 points and 23 rebounds for his CAREER. He’s even got the cool nickname market cornered; he went by Wilt the Stilt, Goliath and The Big Dipper. Off the court I probably don’t have to tell you what he was known for, but I can say he might have been Don Draper’s inspiration (I’m in a Mad Men binge right now). He was also very controversial as a celebrity and was often in the news. Just when you thought Chamberlain would win in a landslide, Julius Erving comes along. Erving was an 11-time all-star, five-time All-NBA First Teamer, NBA champion and NBA MVP with the Sixers. He was also the most iconic player in the ABA with the Nets, racking up the accolades in that league. There is nothing more iconic in basketball than dunking, and boy was he good at that (epitomized by his dunk over Michael Cooper in the ’83 Finals). Maybe Erving’s iconic statue gives him an edge? Nope, Chamberlain has one of those. Surely it’s Chamberlain’s nicknames then. Nope, Dr. J is iconic as it gets. I give the slightest of edges to Chamberlain because he did a lot more with the Sixers, as much of Erving’s legacy was earned with the Nets. Wilt to the regional final. Hell if I know who should win this region. Eleven all-star Games, three All-NBA selections and cornrows vs thirteen all-star Games, seven All-NBA selections and 20,000 sexcapades. The numbers may favor Wilt, but that doesn’t take into account Iverson is my favorite Philadelphia athlete of all time, so that’s not fair. This pains me the most, but Wilt is more iconic with the way he changed the NBA. He scored 100 points in a game. He’s in the Final Four. Mirroring the Flyers region, we have another old-school vs new-school matchup with the legend as the 1-seed in the Phillies region. Mike Schmidt is another staple of a championship Philadelphia team, winning the NL MVP during that 1980 season. He also won the award in ’81 and ’86. Michael Jack, as Harry Kalas would call him, was a 12-time all-star, 10-time Gold Glover and a member of the 500 Home Run Club. He was also elected to the Baseball Hall of Fame on the first ballot with over 96% of the vote, which is damn-near unheard of. His number is retired by the Phillies and he has a statue outside Citizens Bank Park, proving himself an icon. No offense to Giroux (since he’s obviously reading this), but Utley is a much more formidable 4-seed as a player who is still active. That’s partly because Chase has more years under his belt, but he also has a litany of accomplishments in his career. The hard-nosed second baseman is a six-time all-star and four-time Silver Slugger Award winner. He was also named to the MLB All-Decade Team by Sports Illustrated. Most importantly, he was the most beloved player on the 2008 Phillies, who won the first championship for Philadelphia in 25 years. He furthered his status as an icon with a famous line during the victory parade that is, again, not safe for the kids. His immortalization score approached Dawkins-level at it’s peak, and he earned it as a blue-collar player who has hustled for 12 straight years. I have a personal bias toward Utley, but that’s because he’s a core member of the only championship team I’ve ever seen. Schmidt is the more iconic athlete of the two. Richie Ashburn is all legend, which is certainly a good thing during a Philly sports icon tournament. The Whiz Kids of 1950 is a famous era for the Phillies, and Ashburn is the face of that. Richie is a six-time all-star as well, but much of his icon is off the field. His #1 is retired by the Phils, and he is in the Philadelphia Broadcasting Hall of Fame as well. The Phillies broadcast booth is named after Ashburn. An entire area of Citizens Bank Park is name Ashburn Alley. The Phillies also hand out the Richie Ashburn award every year to someone in the organization who shows dedication to baseball. Oh and were back to great nicknames! Ashburn went by Whitey, Putt-Putt and The Tilden Flash. The 50s must have been awesome. Steve Carlton is someone I’m a little bit more familiar with, but not much. Known as one of the best left-handed pitchers of all time, personified by his nickname “Lefty,” Carlton was a 10-time All-Star and 4-time Cy Young Award winner. He won the pitching Triple Crown in 1972, a Gold Glove in 1981 and was the ace of the World Series Champion 1980 staff. He’s another first-ballot Hall of Famer as well, receiving 95.8% of the vote in 1994. His number is retired by the Phillies and he also has a statue outside The Bank. Another tough matchup here. For me this is where the immortalized part really comes into play more than anything else. While Carlton is clearly one of the best pitchers in MLB history, Ashburn has four things bearing his name within the Phillies organization. That’s a true icon. So we have who is probably the best Phillies player ever vs who is probably the most immortalized Phillies player ever in our final. This is the first time I’ll pull out the “rankings” I do in my head to decide who wins these matchups: Schmidt is a 9/10 as a player and an 8/10 immortalized thanks to his number being retired and that statue. Asburn is a 10/10 immortalized for obvious reasons, and deservedly so I’m sure, but for me just a 6/10 as a player when compared to the rest of our bracket participants. I could be wrong, but a .308 average and 2,500 hits isn’t iconic. Schmidt to the Final Four. Much like this year’s NCAA Tournament we reach this year’s Final Four with three #1 seeds. No 7-seed, but I don’t have 7-seeds so you’ll have to settle for Wilt Chamberlain as a two. Four legendary hall of famers representing each of Philadelphia’s four major sports. Who comes out on top? Luckily comparing two different players I’ve never seen play works out just fine when I’m judging how iconic they are in Philadelphia sports history. They’re both leaders of two championship teams. 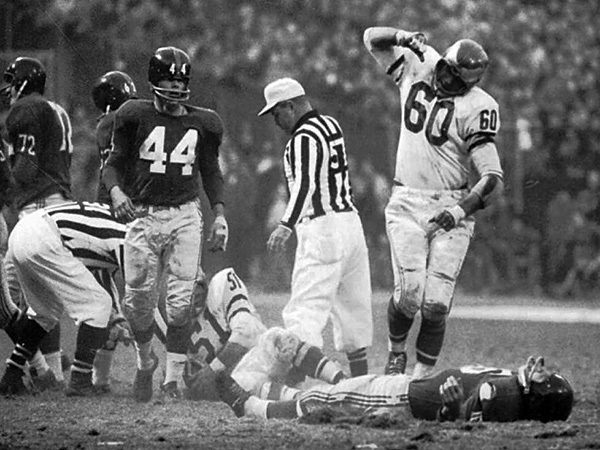 I just can’t seem to get that famous photo of Bednarik standing over Frank Gifford out of my head. Plus remember what I said about Philadelphia being a football town – even if I have them on even ground Bednarik wins for being an Eagle. Chuck to the Final. The Michigan State of our Philly sports icon tournament, Wilt Chamberlain, stands tall literally and figuratively in this matchup. That Sixers region was a bear to get through, and the champion of it deserves to be in the final. Schmidt is a worthy opponent and a legend on the field with a statue off it, but Chamberlain is a legend and has a legacy of more than a statue off the court. Wilt to the final. I would call it fitting that two athletes who started their careers before 1960 are in the final of a Philadelphia sports icon tournament in 2015. To be iconic you need to leave a lasting legacy, and these two men have obviously done that. So who’s the champion? We’re talking about two athletes who are not just Philadelphia icons but overall sports icons in the NFL and NBA. These two Philadelphia-area natives are involved in two of the most famous pictures in sports history (Bednarik over Gifford, Wilt’s “100” photo). They are also two All-Anniversary Team members in their leagues, which means their athletic accomplishments speak for themselves. What separates Bednarik and Chamberlain as icons for me is the legend outside of sports, only because I see them as equally great players. That’s where you hear about how transcendent Wilt Chamberlain was to not just his sport but how polarizing he was as a celebrity (We’re over the validity of Wikipedia articles right? If not, check the 27 references at the bottom). Some of it was positive, some of it was negative, but all of it was iconic. 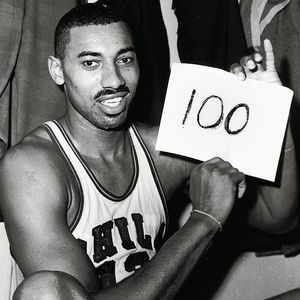 For that reason, Wilt Chamberlain is the biggest Philly sports icon. There you have it. Who did I miss, which matchups did I pick wrong? Let me know in the comments. Thanks for reading.